We get Vodafone bills promptly to our residential address. We do not store it carefully unless we need it. Most of the time we dispose it. Sometimes we might need to submit our phone bills for some reasons. We might have missed it or misplaced it also. When we need to submit the phone bills as proof, the concern might not accept the online bills. Situation might arise when you need to submit the original bill itself. We have given you instructions on how to view your Vodafone bill online and how to get Vodafone duplicate bill through customer care. How to get duplicate bill from Vodafone? We usually get Vodafone bills via email or through post. If you require a duplicate bill you can get it from Vodafone. We can get duplicate Vodafone bill through online, in person, and Via phone. Lets see the procedure to get these bills. Vodafone does not encourage providing duplicate bill to its customer very often unless it is really important. It is good to say the reason to the customer service executive while requesting for the duplicate bill. How to get Vodafone duplicate bill through online? 2. You have to login to the website for Vodafone bill view and vodafone duplicate bill download .Enter the User ID and Password. If you dont have the user ID or password or if you are a new customer, click on "Register". Now enter your phone number, an OTP will be sent to your phone, enter the OTP and give you personal details like name , address etc. You are registered now. 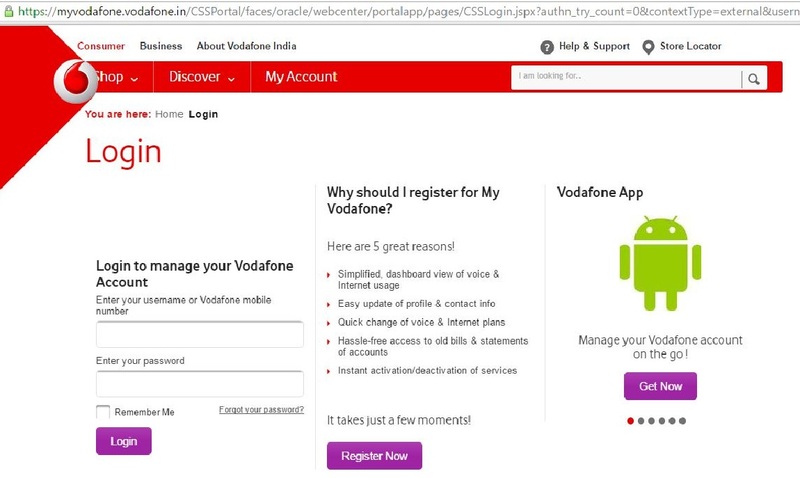 Apart from providing the facility for Vodafone bill view, registration provides few other benefits like simplified, dashboard view of voice and internet usage, easy update of profile and contact information, quick change of voice and internet plans, hassle-free access to old bills and statements of accounts, instant activation and deactivation of services and so on. 3. After logging in click on the "current bill link, you can see the current bill and the history of Vodafone bill that you have paid. 4. You can also download the Vodafone duplicate bill by clicking on download and take a print out of it whenever necessary. How to get Vodafone duplicate bill in person? You can visit the nearest Vodafone customer care service to request for a duplicate bill. You can find Vodafone customer care service branch that is closer to your place by visiting the website or call the customer care service through phone. Approach the customer care executive and let them know your concern and the reason for requesting a duplicate bill. The customer care executive will give you the Duplicate bill. People who do not have internet connection but have easy access to Vodafone branch will find it easy to reach the branch easily to get duplicate bill. If it is on the way to your home, it is the best option. But if the branch used to be crowded all the time, choose to contact the customer care number via phone instead of spending a long time in the office. 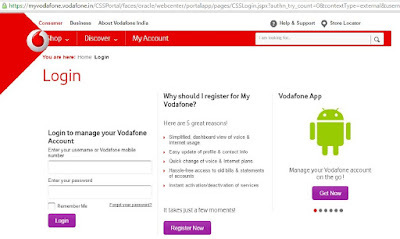 How to view and download Vodafone duplicate bill via phone? To get the duplicate bill via phone, contact the Vodafone customer care by dialing 111 through your phone. Speak to the customer care executive and request for the duplicate bill. The duplicate bill will be sent to you via email or post to your residential address. My Vodafone app is the one stop shop for all your query realted to accounts, billing, services and mobile recharge. You can also come to know about the latest offers for recharges and internet packs through this app. Using this app you can also request for MNP (Mobile number portability ) from one service provider to vodafone. This app lets you know about the data usage for 3G/4G. Manage multiple numbers without any difficulties. Paybills via credit or debit card. Activate and deactivate value added packs. Find the nearby Vodaphone stores. Enjoy unlimited free music via app. The name Vodafone is got from the term Voice data phone. Vodafone is the 3rd largest telecom service provider. Instead of the huge competition in the telecom market, it has bagged the third place on the basis of total number of subscribers and the total revenue across the country. The company has its presence in almost 30 countries. The company boomed in the year 1984 on a partnership basis and became an independent concern in the year 1991. Vodafone entered India in 2007. It was the first company to introduce International roaming call facility. Vodafone Live and Vodafone money transfer service via m-pesa has been successful. Its service and innovations has gained over 400 million subscribers. Vodafone has beat the records and has become the third largest mobile communication company in a span of 30 years. This article explains clearly about the procedure to get 'Vodafone Bill View - Duplicate bill download details' and also about MyVodafone app services. Hope this article is useful for you.